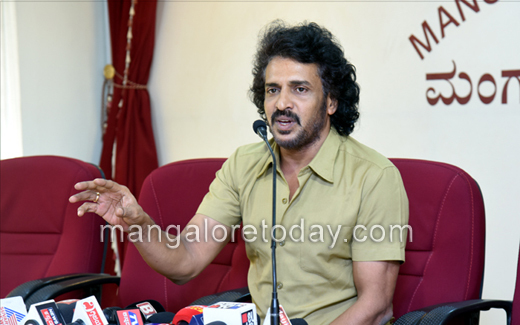 Mangaluru, Dec 05, 2017 : Popular Kannada actor Upendra who is in the news ever since he floated his Prajakiya political outfit – Karnataka Prajnavantha Janatha Paksha, is in the city on December 5 and spoke to press persons at the Press Club, wherein he outlined the objectives of Prajakiya and explained how he wants his party and its members to always stay grounded and walk together with the people while trying to solve their problems. Stressing the need to put an end to the spending of crores of rupees on campaigning by political parties, Upendra regretted that politics has become more of a busines these days. He said the need of the hour was for a system where all elected representatives serve their constituencies with total commitment. T his is the objective of my party, said Upendra. Commenting on corruption, Upendra said there would be no scope for the same if education and health facilities are offered free of cost to all. He said he intends to select candidates for all 224 constituencies in the state.Aspiring candidates can fill applications through the Prajakiya App, said Upendra. The process of finalising candidates would be completed by January next year, he informed. He said his forming a political party was a first step in realising some of the visions he has projected in his movies.